Labels: 2016, Activity Report, Annual Report, arunachal pradesh, vivekananda kendra arunjyoti, Vivekananda Kendra. Vivekananda Kendra Arun Jyoti organized a few free medical camps in Namsai district from 14th to 17th June 2016. 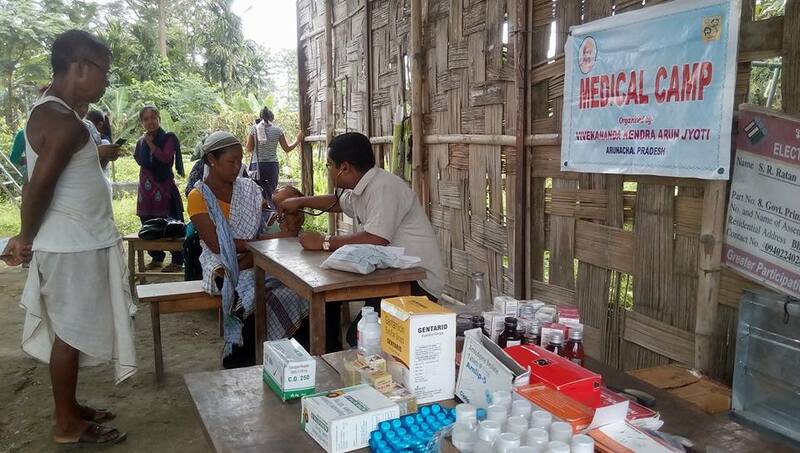 Medical Camps were organized at Krishnapur and Kumari Khamti of Mahadevpur circle, Nongtaw Shyam of Piyong circle, Bhogamur and Mengkang Miri of Namsai circle. A total 669 patients were examined in these camps and free medicines were distributed accordingly. All Lekang Youth and Student Union, Mahadevpur (ALYSU) office bearers and volunteers associated with Vivekananda Kendra for the camps of Mahadevpur area. The CDPO of Namsai collaborated with the mobile medical team of Arun Jyoti and under the SABLA scheme for adolescent girls of ICDS; Iron Folic Acid (IFA) tablets were distributed to the anemic girls after a thorough health check-up in Namsai and Piyong circle. 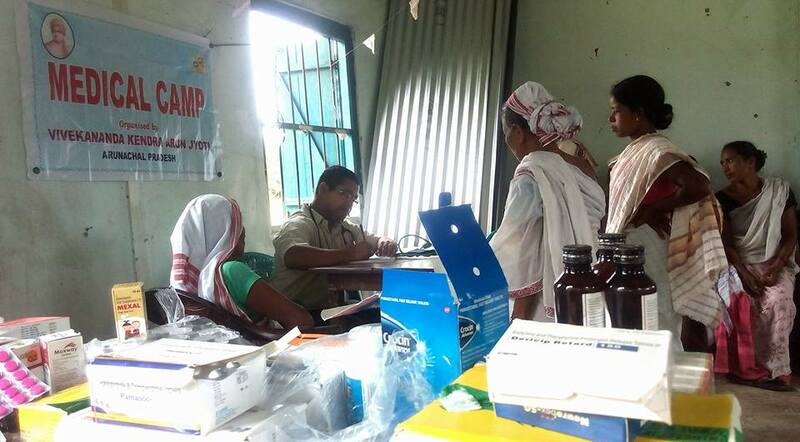 The CDPO, Namsai provided the IFA capsules for the entire camp.The Doctor of the medical team interacted with the Anganwadi workers and PRI members of the villages in the above mentioned villages and encouraged the pregnant women for ANC and institutional delivery. It is to be mentioned that Dr.K.Subramaniam, a Vivekananda Kendra well-wisher Doctor from Chennai donated some medicines for our free camps and the medicines contributed by him were extensively used during the recent camps. Mananeeya Eknathji Janmashati Prava, Arunachal Prant has organized Four (days) Yuva Prashikshan Shivir for the Selected Youths, who are working for the social upliftment in eastern part of Arunachal Pradesh five districts, Namsai, Tirap, Changlang, Lohit and Longding of arunachal Pradesh. Camp was conducted at Zenith Child School, Namsai, 20th to 23rd April 2015. 86 participants or karyakartas were taken participated in this camp. The main objectives of this camp were to upgrade the quality, positive direction and to inculcate patriotism, cultural value, self discipline and the attitude of Social Service, formal and informal education, health and hygiene, with the twine ideal of Vivekananda Kendra “Man Making - Nation Building” through the various sessions on yoga, lecture, concentration & memory development games and group discussion. Camp inaugurated on 20th April 2015 by Chief Guest Venerable Agga Dhamma, Chief Monk of Buddha Vihar Monastery, Namsai, He said that by doing so, they will be able to strengthen their self-confidence and able to face any of life’s challenges in the future. He believed that by providing youths with positive and constructive activities to occupy their time, they will be affected morally, and eventually become a better person who will one day contribute to a better society. Camp concluded on 23rd April 2015, where chief guest Shri R.K. Sharma, Deputy Commissioner, Namsai and Guest of honor Shri Sange Tashi Thungdok, ZPM Rupa addressed the participants and other invitees Karyakartas as a concluding speech.